I hope you all had a wonderful weekend. I am excited for the warmer weather we have this week. Running outside is one of the things I look forward to the most. Since my first 10K is less than a month away, I bought myself some new gym gear to keep myself stay motivated. I get the majority of my workout gear from Old Navy/Forever21. Not the best stuff but they do the job. I am always on the lookout for some bright workout pieces and thrilled to add these to my basic black fitness wardrobe. I will be sure to be on the lookout for those pants, they are so cute!! Very fun, bright workout outfit. I am also really digging your mirrored sunglasses! I wish I could pull off aviator style but have never found a pair that looks right on me. Where did you get the pants and jackets from? Their website only shows the neutral colors. I love the bright colors that you have. @petitecook I bought it on Amazon but this particular color is no longer available. I love the colors, esp the pants! 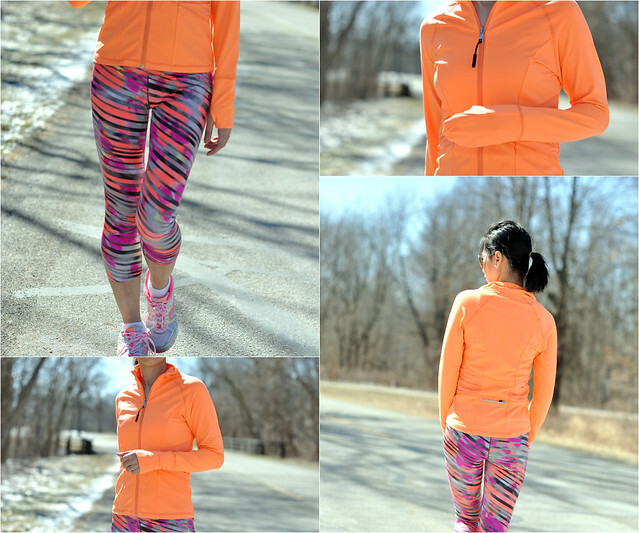 Bright colors are a must when running outside. Oh my gosh, I love your work out wear!! I want new workout clothes and keep adding one new piece at a time. Colored pants and new fun running shoes are next on my list!! Sydney, your work out wear makes me want to work out!